If you are a repeat visitor to this site, you may have noticed that the “header” at the top of the page (the wide photo) changes each time you navigate here or reload. The software randomly serves you one of the images we have designated for this space. And, if you have read our “ABOUT …” page, you know that the “view” of our title is a metaphorical one. We do live in a place of wonders, but we cannot see the ocean from East Tennessee, nor do we have horses in our neighborhood. Those headers are mementos of travels off our ridge. So it is not cheating that the latest addition to our header images is a famous panoramic view some 400 miles northeast of us. In that view, we are standing in West Virginia. In the valley below, the Potomac River flows toward us and (out of sight below the photo) curves to the right below our overlook. Maryland is on the right side of the river. The distant mountains just visible on the right are in Pennsylvania. The view is famous; the photo is Nancy’s—one of those marvels of digital photography in which you slowly pan from left to right while the camera shoots rapid-fire stills and then stitches them together to form the panoramic image. From that overlook off WV 9, west of Berkeley Springs, on the west slope of Cacapon Mountain, the diligent observer might catch glimpses of history. We are told that colonial partakers of the waters at Berkeley Springs, including George Washington, rode out to this same vista. And in the valley below, the Chesapeake & Ohio Canal and the Baltimore & Ohio Railroad competed to link the Ohio Valley with the Atlantic ports. (Both began construction on Independence Day of 1828.) While we were standing at the overlook, a train of the B&O’s modern day successor (CSX) ran below us on the near side, on original right-of-way. Remnants of the C&O Canal (in commercial operation until 1924) still exist on the Maryland side of the river. I knew nothing of this history when we set out that day. Arrested by the visual view, we stopped, read the roadside plaques, and stumbled onto another view—of history and geography and technology—of which I had been barely aware. That happens to me often. I have written earlier about the joy of filling in my terra incognita. But my incognita are not limited to terra. On a good day, and there are many, I am blessed with some new view, some new knowledge, some new insight. Travel is good for opening vistas. As are books. It has been a good reading year. Favorite authors Ann Patchett, Barbara Kingsolver, Isabel Allende, and Charles Frazier, through books new to me and others read for the third time, have taken me to Haiti, Chile, Mexico, the Amazon, Napoleonic Spain, Colonial California, Congo, New Orleans, the Cherokee Nation, and the southern Appalachians, to the world of opera and the showmanship of magicians, to transcontinental migrations of species and the tortured home fronts of the American Civil War. Ken Follett took me to medieval Europe and on a breathtaking tour of the Twentieth Century’s follies; Robert Hicks back to the Civil War and New Orleans. As I think about the vistas that I’ve encountered, I realize that newness is only part of the thrill—in fact, the lesser part. What most excites me and draws me farther in is the interconnectedness, the sense of unity. What I see anew or afresh is part of a whole I’d perceived, and still perceive, only dimly. Other books, news stories, magazine articles, roadside plaques, random conversations, and other sources connect and re-connect to places and times and themes that are somewhat familiar and yet made more complete by the connection. The blank places on my map get filled in. And yet, in every case, new blanks appear. It turns out that not only is what I don’t know limitless, but what I don’t know about what I don’t know is also limitless. That is strangely exciting. There is still so much more to see! Nancy was to give a workshop this weekend, and attend the opening reception for a show which includes some of her paintings. But a water leak in the Ice House nixed those plans, and the activities will be rescheduled. The rest of the trip, however, was great. 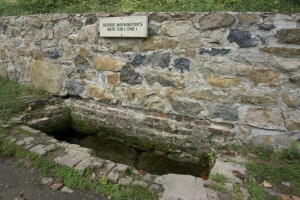 George Washington’s Bathtub, Berkeley Springs, WV. We delivered the paintings early in the week and then played tourist. Berkeley Springs, WV, (originally Town of Bath, VA) has a long history as a tourist destination, due to its warm mineral springs, mountain setting, and proximity to Washington and Baltimore. George Washington spent time there, and one person-sized spring-fed hole in the valley floor is called his bathtub. We did some driving, some hiking, some good eating. Then we moved on, through Harpers Ferry and the horse country of northern Virginia, to visit the grandkids. We had the opportunity to spend a whole day with them while their parents were at work. The three-year-old has always favored his grandfathers over the grandmothers, so it was a delight for Nancy to be the favorite of the almost-one-year-old, who constantly flashed her smile and her two teeth. Grandson and I spent some time with his “tricybicle” (TRI-si-BI-kul), but he is mostly a sticks-and-stones kind of guy with a great imagination. Sticks become smokestacks, vacuum cleaner extension wands become leaf blowers, and play is accompanied by complex story monologues. We returned to Berkeley Springs, where we learned of the cancelations and decided to go home early. Travel is fun—seeing new sights and learning new things and eating new foods. But there is no place like home. “Is that trash?” asks Nancy, pointing to a large barrel on wheels. “Help yourself,” replies the Home Depot guy. So Nancy begins pulling lumber pieces out and loading them into our cart. Not fancy lumber, but the rough stuff used to protect the good stuff from the steel bands that hold the bundles together for transport. “Yes.” She makes two or three more trips from the trash barrel to our cart. “I repeat: You have room for that in your studio?” She gives me a look—part smile and part not—and I walk away. Later, in the car as we chuckle about it, I tell her I read that smile to say, I”m going to keep this up until you get that disapproving look off your face. She does not deny it. So the struggle over what to keep and what to throw away is intense in our house. Since Nancy grew up in a household of creative reuse and since many of her projects tend toward collage, her predilection is to save. Mine is to toss and reclaim some space. I confess, many’s the time I threw away a lumber scrap only to need it a week later. Many’s the time I have asked Nancy, “Do you have ____?” and she does. And yet, other scraps I have saved for years without finding a use for them, until they’d mildewed beyond salvage. In the ensuing week after the Home Depot episode, Nancy spent a great deal of time rearranging her studio and moving some little used stuff out as she gears up for some larger projects. Yet the salvaged sticks still reside in a place of honor inside the door. Except for the ones I borrowed today—temporarily—for a project of my own. The premier dumpster-diving story in our family involves a rescued dolphin, Greek pastry, and a stroller. We were in Florida on vacation, and on our way to see Sunset Sam at the Clearwater Aquarium. Sunset Sam had injuries that prevented his release back into the wild, and had been taught to paint with a brush in his teeth. He was a regular on our vacation agendas until his death a few years later. On this visit, Jay was about two. He fell asleep in the car before we arrived, so we decided to abort the Aquarium stop and let him nap, while we went to Tarpon Springs for Greek pastries. Nancy was driving, and I had just mumbled something about how uncomfortable it would be to carry a sleeping two-year-old around in the heat when she suddenly did a u-turn on a residential street and stopped next to a pile of trash awaiting pickup. A stroller. Rather, a rusty stroller frame, the canvas seat rotted out. Jay’s car seat fit perfectly in the frame. We used that stroller frame for the rest of our trip. When I threw it into a dumpster as we packed up for our return to Tennessee, Jay cried. His mother’s son.